Modern parenting is so much easier with modern conveniences, isn’t it? The power grid we rely on supplies us with the comforts of heat and electricity, hot water at the turn of a bathtub tap, light at the flick of a switch. Miles of roads make it second nature for us to drive anywhere for any errand, big or small (like when your kiddo needs chocolate chip cookies baked for her class the very next morning). The same goes for our supply chain of food and provisions. In the Puget Sound region, we enjoy the global spoils of port-city life at our fingertips: From European cheese to Korean bath salts, whatever you need (or think you need) is a mere car ride away to the market or mall. But what if we intentionally stepped back and examined the impact of all our energy use on the planet? How many dams impede fish spawning in order to keep our washing machines and Xboxes running full-time? How much fossil fuel do those tanker ships require? On a more personal scale, all that infrastructure isn’t free either. Owning a car and heating a home are increasingly expensive. More and more, the decision to opt out of some part of the grid is a financial decision, not just a philosophical one. The families you’ll meet here have more in common with the creativity of the hippie movement than the stark retreat of the more recent survivalist movement, whose participants seek grid independence and reject government oversight. These are urban and rural families, some relying on a single income to support households with one or more children. They don’t shun technology; in fact, many rely on it to help achieve their sufficiency goals. They all emphasize that their journey to greater energy independence has been gradual and deliberate, and that it takes work and planning, even while increased self-reliance has also simplified their lives. Can the rest of us learn something from these families to try for ourselves? In spite of living intentionally car-free for more than 13 years, Carla Saulter shies away from claiming off-the-grid status. “I actually don’t think of riding public transit as being ‘off the grid,’” she says. “Rather, I think of transit as an existing grid that people can plug into.” She and her husband, Adam, and their two young children rely on bus or walking for getting around from their home in central Seattle. Familybike, a Seattle resource for cycling families. Folks, This Ain’t Normal by Joel Salatin, influential farmer for sustainable practice. Saulter grew up in Seattle, commuting daily by bus to her elementary school, which was across town, from the age of 8. Her ease with riding the bus fueled her later decision to go car-free altogether, when as an adult back in Seattle after college, she was shocked by the growth and traffic of her beloved hometown. At the same time, she met her soon-to-be husband (on the bus! ), whose own motivation to live without a car was financial. Together they have honed a life that reflects their values regarding community, economy and a low carbon footprint. Their children’s elementary school is within walking distance, as is their library, grocery store and the children’s clinic. “My kids have walked since age 2,” Saulter says. “I rarely used a stroller commuting, since it is such a hassle on the bus.” And not having a car is great for parenting. “The bus ride is the entertainment; the ‘going somewhere’ is part of the fun and together time. Eight years ago, the Eells’ one family car conked out, and they never replaced it. Rachel and Michael were already thinking seriously about climate change now that they were parents of Oliver, an infant at the time, and they both desired a smaller footprint. 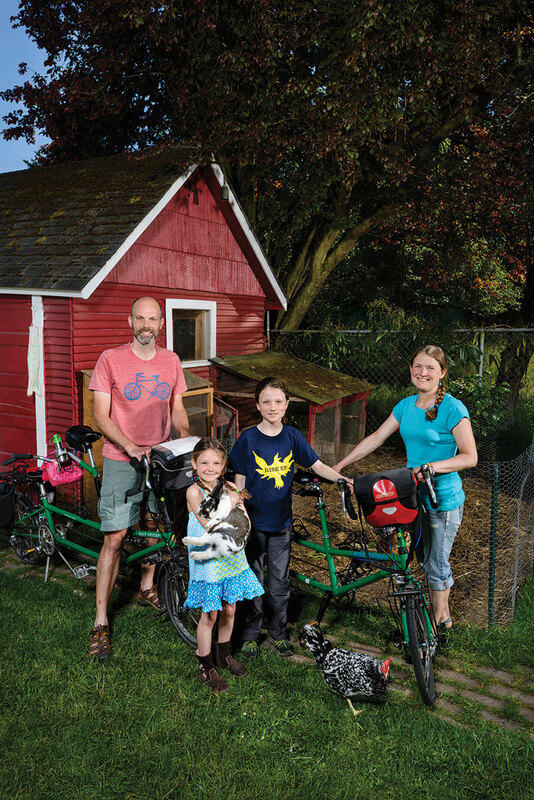 They had slowly been working toward minimizing before the demise of the car: living in a 700-square-foot home in Seattle’s Columbia City neighborhood, growing much of their own produce, cycling to their teaching jobs and shopping locally. So taking the leap to being car-free seemed preordained. The family owns two tandem bikes in addition to other cycling gear, and they bike no matter the conditions outside. “Cycling is being a part of where you are going, feeling connected to the weather and geography,” says Michael Eells. They even vacation on bicycle, cycling as far as Glacier National Park last summer and taking the train back. Growing up on Lopez Island as a child with a back-to-the-land mother, Abigail Prout yearned for something similar for her own kids. “I grew up in nature, with beauty over function,” she says of her childhood spent without electricity or running water until age 10. “Nature is still important, but so is creating physical community.” She and her husband, Clive, decided to return to San Juan County to raise their two daughters, Nonie and Sophie, at the same time that the local land trust was building a sustainable community development. “We were drawn to this planned community for its proximity to town and other families,” says Abigail Prout. “It’s easy to romanticize the isolation of a rural setting, but people need engagement.” That the land trust community was also purposely built to be energy efficient made the decision even more attractive to the Prouts. 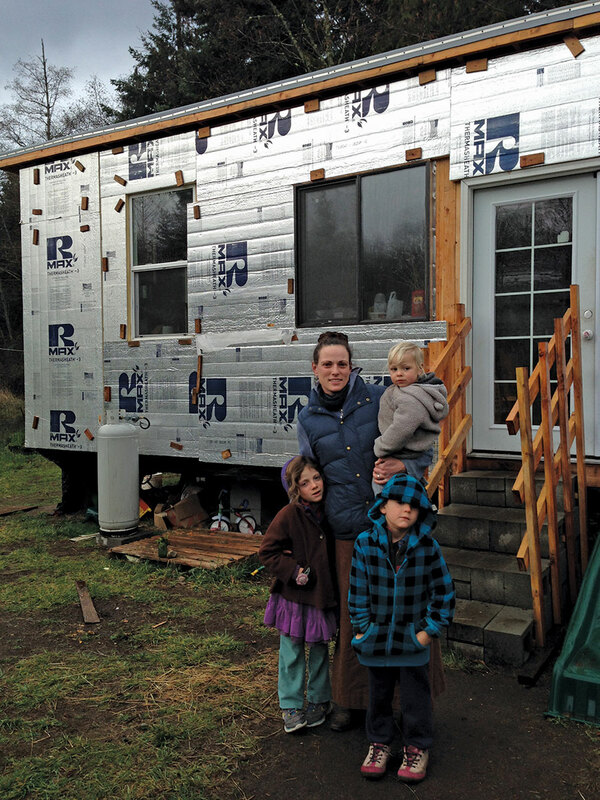 What made it affordable was their participation in their home’s construction: Clive put in 32 hours a week building, along with other volunteers from the island. The houses in the community (on an island with a population of just over 2,000) feature energy-efficient design: Each home faces south, is built on a concrete pad and boasts a metal roof to take advantage of heat gain; windows open and close for cross-ventilation; exterior walls are of straw-bale construction to offer insulation in the winter and heat protection in the summer; each roof is equipped with solar panels; and all energy produced by the panels is shared among the homes. Some families manage to achieve net zero exclusively with the power provided by the solar panels. But the community is not really off the grid. “Our local utility charges us $40 a month to be connected,” explains Chris Greacen, Abigail Prout’s brother, who also lives in the community. “We need to be connected because, through net metering, we treat our utility as a big battery, storing summer-generated electricity for wintertime usage.” Whatever energy surplus is generated by the community’s solar panels is consumed within the community well before it makes it back into the island’s greater grid, he says. Even so, on the day of my visit in late November, the Prouts’ home was toasty warm, thanks entirely to their wood-burning stove. We drank tea in the dazzling morning light coming through windows overlooking the meadow between the community and the nearby village. The placement and structure of their home were clearly paying off. “It feels really good living in an efficient home; I feel like I’m doing my part,” says Abigail Prout. But she admits that by living in a rural setting, she and her husband are forced to drive more for both work and family. “So many people who choose to live here do so for the simplicity and for the nature. But you have to drive. Then there are the ferries . . . ,” she says, explaining that the conversation about conservation never really ends. What does the process of making the switch from conventional to off the grid look like? 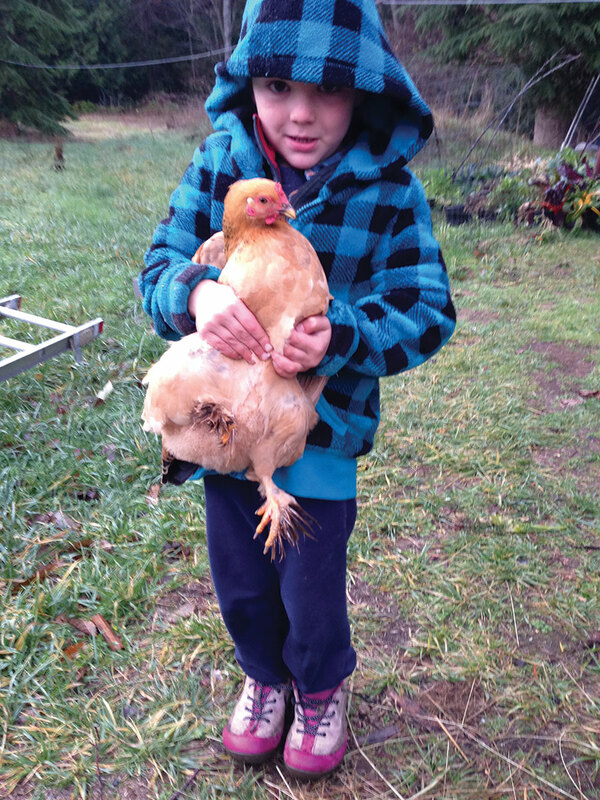 This family is living this process, currently midway toward creating a sustainable homestead. Rachelle Merle, a fifth-generation islander (from the San Juans and, more recently, Whidbey), has rural living in her genes. She and her husband, Ryan Merle, live outside Port Townsend in a home they’re building, designed to be totally self-sufficient once completed. “Starting two years ago, we knew we wanted to do something like this,” says Rachelle Merle. They were intrigued with the idea of building something themselves and being independent from the power grid. “We want to live closer to the actual land, to be able to hear what’s going on outside.” The family of five (the couple has three children, ages 6, 4 and 2) relies solely on Ryan Merle’s income working for the government. They determined that they could get by on one salary if they proceeded toward self-sufficiency, with the aim of long-term reduction of both their carbon footprint and their expenses. They collected salvaged windows, cabinetry, a woodstove and appliances, and even upcycled the trailer frame on which they built their home so that it is portable. “Ninety percent of our windows and appliances came from the local salvage store,” says Rachelle Merle. The need for a portable house arose from timing: “Our intent was to buy land and build the structure there, but the right parcel just wasn’t coming up,” explains Ryan Merle. So they dove in, constructing the house on wheels last summer on rented land instead. Even as we stand in the rain outside their home, tarps over the unfinished siding flapping in the wind, I feel the family’s determination. Their outgoing expenses (such as rent, phone line, food and car insurance) are minimal, and once the house is finished, they can cross building materials off the list. And to ensure their departure from the electrical grid, they are planning for solar electricity with storage capacity once they are permanently settled. Currently, they are already halfway to their goal. While they are hooked up to water and electricity, much like a mobile home, they have a composting toilet and reuse all of their gray water. They grow 60 percent of their vegetables in containers, and they keep chickens. Her steely blue eyes and confidence give her the air of a countrified Katharine Hepburn; she exudes the conviction and assurance of someone who gets things done. I could imagine myself getting discouraged at the halfway point to building a dream, when the rain is coming down, the house is unfinished, and the children are young. But those same conditions can also be viewed as the glass half full: Nature is audible from outside, the home has potential and the children are full of wonder. This family will finish their homestead. 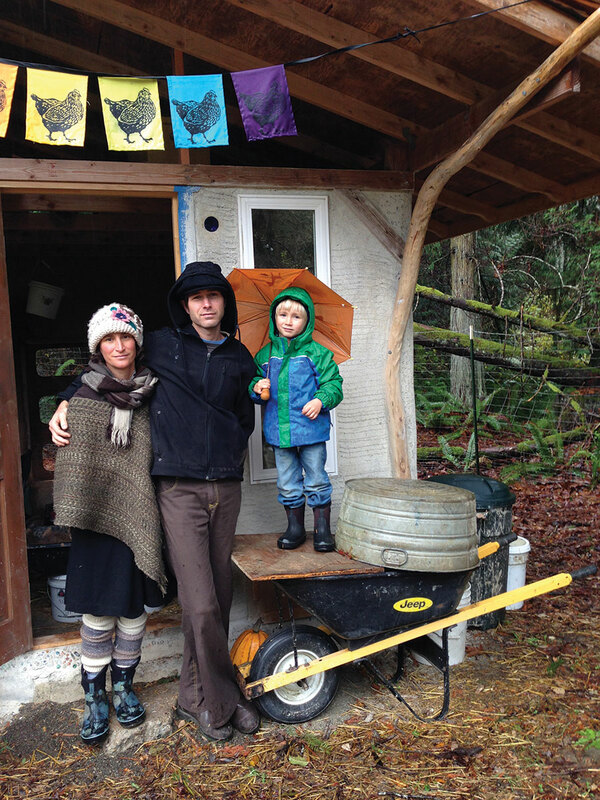 On the morning I visited Keeth Apgar and Nala Walla and their son, Montana, they were drying apples (from their own trees) over their woodstove and drinking tea (filtered rainwater heated on a propane stove) in their beautifully crafted one-room main house. The image was of bucolic self-sufficiency: a picturesque property of little buildings, each serving a purpose; a garden surrounded by a fence and hand-hewn gates; a covered and neatly stacked woodpile; a child’s playhouse; and an outdoor entertaining area. “Everything you see we’ve built by hand and maintained by hand,” says Apgar. So don’t romanticize this too much is how I interpret his statement. 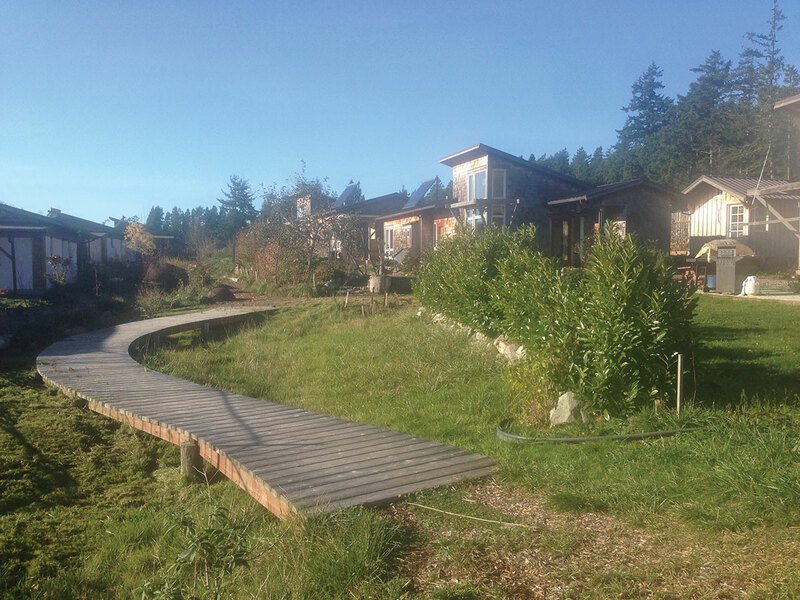 All the same, one cannot help but be charmed by the setting and impressed by the systems the family has established on their 5 acres in the woods outside Port Townsend. Since 2004, the couple has planted 40 fruit and nut trees and countless other edibles, built their main house, a recording studio, an apartment/barn, a yurt for one of their land partners (they also rent out space in the barn to another friend), and most recently have constructed a duck and hen house from cob and rammed earth. They process their own waste, produce their own electricity through solar panels, heat their home with wood, cook food and heat shower water with propane, harvest rainwater for bathing and drinking and create their own internet hot spot by turning Apgar’s phone into a modem. I visited the Merle family and the Apgar/Wallas on the same unendingly rainy day in November, an occasion when the challenges and advantages of self-sufficient living were most evocatively on display. The Apgar/Wallas’ tidy, zipped-up utopia belied the tremendous amount of work that had gone into creating it, let alone maintaining it. The Merles’ halfway point is the better example of the sheer will needed to tough it out through the hard parts or rather, live within them until the season changes. These families are all united in how hard they work: As I left that day, Apgar was already at work chopping wood — nothing romantic about it.